The Skagway Valley is a Glacial Valley about 10 to 15 thousand years old. Twenty thousand years ago glaciers filled the Skagway Valley and extended south for more than 100 miles down the Inside Passage. As the glaciers receded the valleys opened up. The town site of Skagway is built on the flood plain of the Skagway River that was formed as the Glaciers melted and receded. Before the Gold Rush the Skagway Valley was uninhabited, the native people never settled here because the valley is small and narrow. It is not nearly as prolific in wild life as the Haines area just 15 miles south of us. The valley gets even more narrow and rocky as you approach the summit and is inhospitable to moose. Moose never venture down into our valley because of the rocky difficult terrain. Haines in contrast, like much of Alaska is moose territory. For the Skagway gardener this is very fortunate for moose are very troublesome for gardeners throughout the state. Here they aren’t a problem. Photo courtesy of the Klondike Gold Rush National Historic Park…. This photo also appeared in the National Geographic Magazine July 2011; Henry Clark is holding a yardstick to show the size of his large rhubarb. Back to our history, the Gold Rush Stampede came through Skagway because of the White Pass. This pass is the lowest pass on the south side of the Yukon Territory. For over a hundred miles south on the east side of the Lynn Canal, the Juneau Ice Field is a continuous Glacial Field that brought the stampeders north for an easier route over the mountains. The native people used the Chilkoot trail as their route to the interior before the Gold Rush. It’s actually about 1000 feet higher than the White Pass but it is a much quicker way to get to the lakes and river system. When they reached the Chilkoot Summit they used boats to travel the lakes and rivers of the interior valleys to trade with the native tribes. The Chilkoot Pass is the pass often seen in Gold Rush photos with its steep incline, known as the Golden Staircase. A steady stream of prospectors with heavy backpacks trudged up the mountain in the snow the fall of 1897 and spring of 1898. Just as the natives had, the masses of gold seekers used the established Chilkoot Trail about 10 miles west of Skagway to get over the mountains. But that first winter there was an avalanche that buried about 70 people alive and suddenly the White Pass looked much more attractive, and became the preferred route. Thousands of people passed through the Skagway Valley to go over the White Pass. Among the early stampeders there was a young dairy farmer, named Henry D. Clark from Wisconsin. He realized there was an opportunity to provide fresh fruits and vegetables to the thousands of people rushing through the Skagway Valley. His bride Marion joined him from Wisconsin and they raised 2 daughters in Skagway. Jewell Gardens is located today on the site where Henry Clark set up a homestead and began gardening. At that time, with tens of thousands of people passing through bound for the gold fields, Skagway was the most populated City in Alaska. 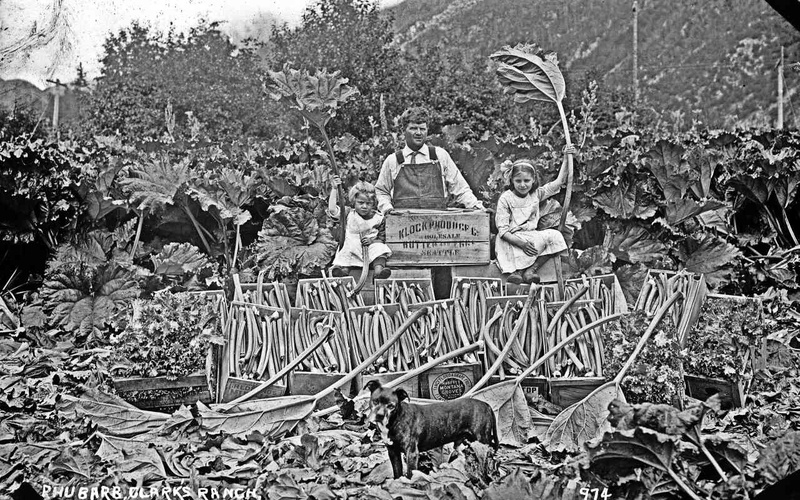 Fresh produce was hard to come by and even harder to afford here during the Klondike Gold Rush. In the summer of 1898 a handful of entrepreneurs tried their luck at farming in the Skagway Valley. 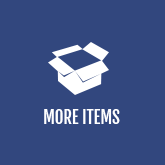 A few successes were reported in the Skagway News and Skagway’s rich gardening history began. By the turn of the century farms were established in both the Skagway and Dyea valleys – Clark’s farm and the others created the largest areas under cultivation to date in the Territory of Alaska. The first place in the Territory where the population was large enough to support a production garden the size of the Clark Farm. Henry and his partner Nikolai farmed almost 200 acres in the Skagway and Dyea valleys. Henry’s market garden located on our site was about 44 acres. Although Henry Clark grew many other vegetables, he is remembered for his rhubarb. 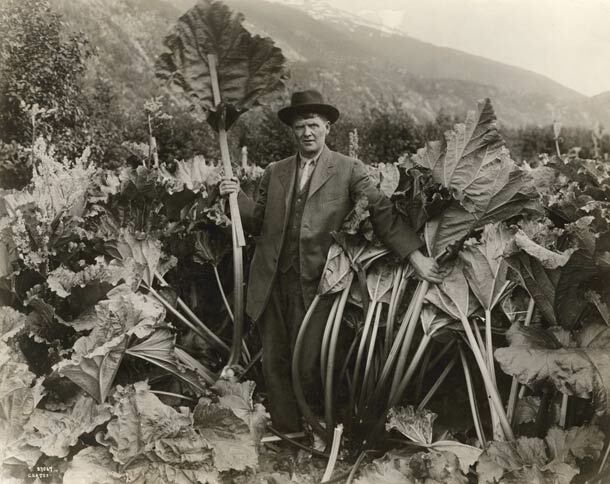 He grew rhubarb is such abundance and size that the locals referred to him as the “Rhubarb King.” Many homes today raise decedents of Henry’s monster rhubarbs and you can see them in great abundance at Jewell Gardens where Henry Clark grew them over a hundred years ago. He successfully gardened here until World War II. Skagway became famous for its gardens very quickly. Gardeners were proud of what they could grow in the “Land of the Midnight Sun”, where vegetables grow larger due to the long daylight hours. A group of business owners began the first Alaskan Garden Competition here in Skagway in 1902. 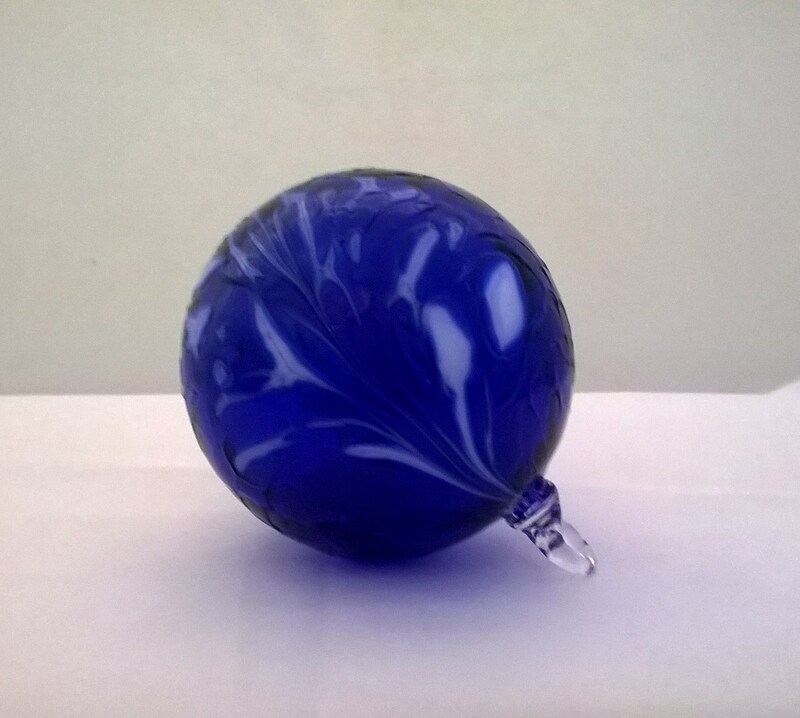 Local Goldsmith Herman Kirmse offered Sterling Silver Serving Pieces as the first prize. By encouraging the local gardeners, they hoped to change Skagway’s rough Gold Rush image to that a more civil community that might attract families instead of con men. They called Skagway the “San Francisco of the North” and had great hopes for its future. The White Pass Railroad gave the town a permanence and industry no other town in Alaska had. From the time of the Gold Rush until WWII visitors that came to Skagway would walk through town and admire the gardens. Over 100 years ago the White Pass RR’s advertisements invited tourists to come north, “Ride the railroad that was built of gold, and visit our lush, beautiful gardens”. The Pullen House, known as the most lavish hotel in the State, had a fabulous garden with swans in their pond. 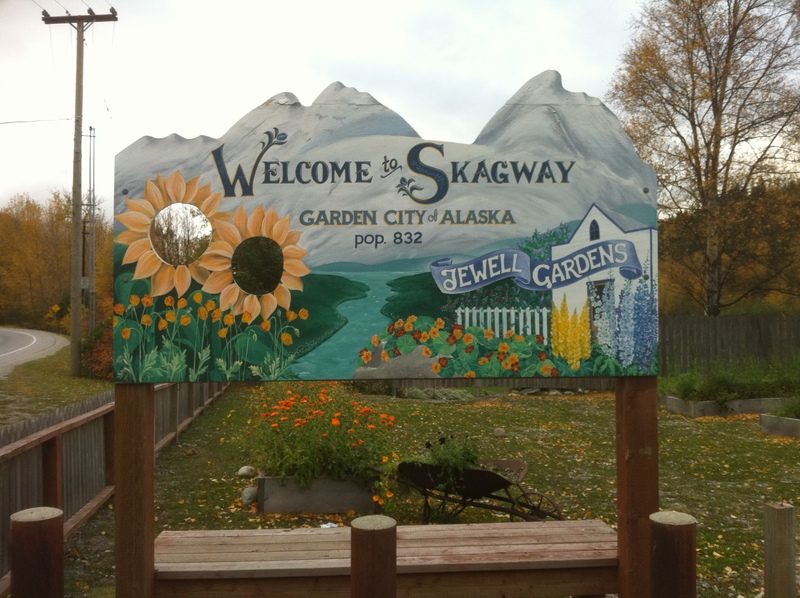 The local newspaper editor coined the phrase “Skagway, Garden City of Alaska” and used it as the byline of the local newspaper for nearly 20 years. In 1923, President Warren G. Harding visited Skagway, the only US President to ever visit our valley. He was only here for 4 hours but when Martin Itjen took him on a tour and he visited 3 gardens. His wife was given a big bouquet of fresh flowers from Charlie Walker’s garden. When President Harding referred to Skagway’s Gardens in a speech, he proclaimed they were a fine asset for the City, and having the President of the United States rave about our gardens helped to spread the fame of Skagway as a Garden City. Mount Harding & Harding Glacier named after President, can be viewed from Jewell Gardens. During WWII Skagway became the supply depot to build the Alaska Canada Highway. It was a logical place for the Army to stage, to take men, equipment and supplies into the interior. The White Pass Railway was an established route to the interior. The train had been running year round the ever since the Gold Rush. The railroad ran 30 to 40 trains a day during the war, 24 hours a day. The army also built a pipeline parallel to the train track to carry fuel to the interior. A fuel storage facility was needed to hold fuel for the diesel trains and supply the army building the highway. Henry’s north 40 became a tank farm with 16 huge above ground fuel tanks. They spread the tanks out over 80 acres, they didn’t want them clustered together where they would be too vulnerable if there were a bombing and with several thousand troops here, Skagway was a target. The reason we tell you this story is because it affected the garden site. 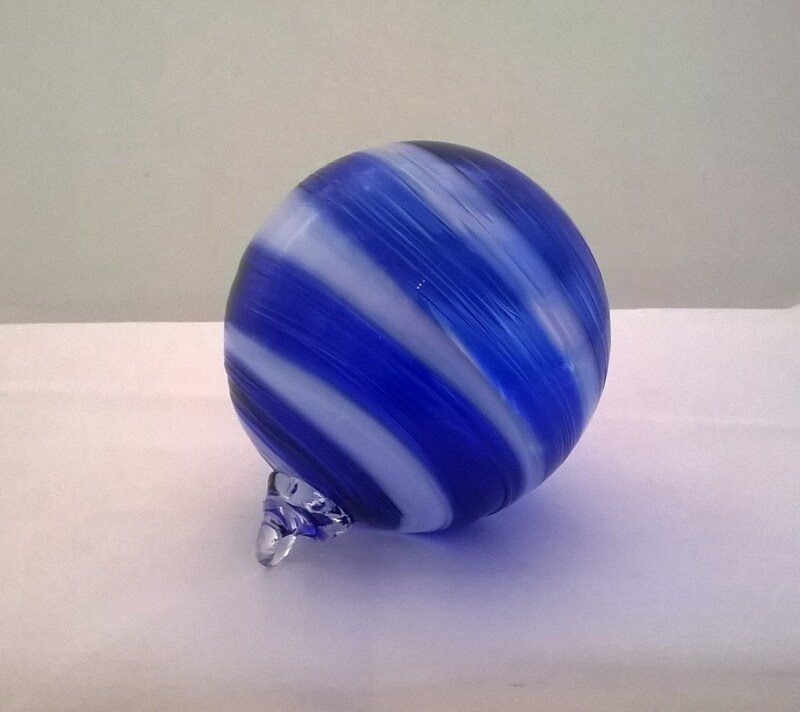 In the mid 90’s a bulldozer hit a pipe along the RR tracks and oil was spilled into the Skagway River, that brought the State Department of Environmental Conservation in and they reported to the Environmental Protection Agency. The EPA closed the tank farm and had it dismantled and they started a massive cleanup. In 1996 Charlotte Jewell, a well-known gardener in Skagway, acquired a small portion of Mr. Clark’s farm and began her dream of creating a show garden in Skagway, the “Garden City of Alaska”. Jewell Gardens had already been established on the Clark Homestead Site when the oil clean up began north of it. After three years planting and developing an Organic Show Garden, all of it was dug up to remediate oil that was contaminating the ground 4 to 8 feet under the gardens. The garden topsoil was not contaminated. So when you visit our site, everything in the Garden has been planted since Spring 2001. 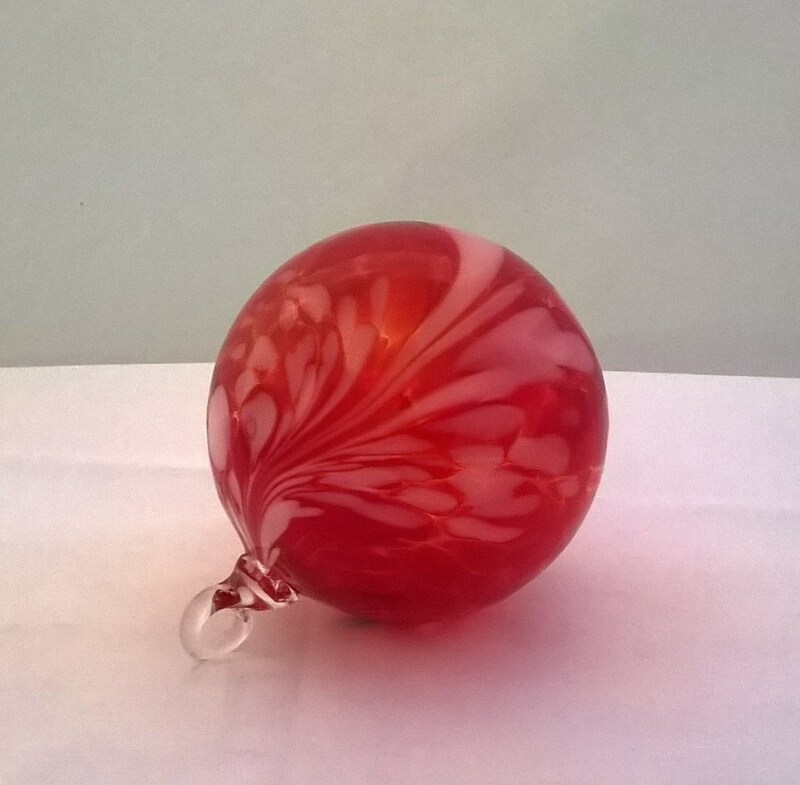 In 2007 the first public glassblowing studio in Southeast Alaska was built on the property and now is the only place in the world where cruise visitors can blow their own glass on a shore excursion! The garden & glassworks is a popular stop for the many people (and gardeners) who visit Skagway each summer. Here is Henry with his two daughters preparing to ship rhubarb in wooden crates.